In addition to the official SAM-BA pages on http://www.microchip.com , we maintain information about SAM-BA in the SoftwareTools page. use SAM-BA 3.2.y onwards. You can download it here: SAM-BA 3.x release page . In addition to the Qt5 QML language for scripting used for flashing the demos, most common SAM-BA action can be done using SAM-BA command line. For browsing information on the SAM-BA command line usage, please see the Command Line Documentation that is available in the SAM-BA installation directory: doc/index.html or doc/cmdline.html . The command line interface is designed to be self-documenting. -v, --version                          Displays version information. -h, --help                             Displays this help. -x, --execute <script.qml>             Execute script <script-file>. -p, --port <port[:options:...]>        Communicate with device using <port>. -d, --device <device>                  Connected device is <device>. -b, --board <board>                    Connected board is <board>. -m, --monitor <command[:options:...]>  Run monitor command <command>. -a, --applet <applet[:options:...]>    Load and initialize applet <applet>. -c, --command <command[:args:...]>     Run command <command>. Additional help can be obtained for most commands by supplying a "help" parameter that will display their usage. Command that take an argument with options (port, monitor, applet) will display even more documentation when called with "help" as option value. $percntH$percnt If you need to store the root filesystem on a SD Card, use information contained in StroreRootFSonSD. This is useful for Linux4SAM demos older than 5.6. $percntX$percnt use SAM-BA 3.2.y onwards. You can download it here: SAM-BA 3.x release page . Detected memory size is 536870912 bytes. Page size is 4096 bytes. 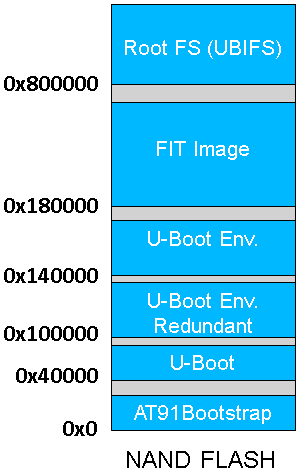 Buffer is 20480 bytes (5 pages) at address 0x0020a240. You can figure out that the default PMECC parameter for this == board is $percntORANGE$percnt0xc1e04e07$percntENDCOLOR$percnt. Applet 'NAND Flash' from softpack 2.10 (v2.10). For information on NAND header values, please refer to SAMA5D4 datasheet section \"12.4.4 Detailed Memory Boot Procedures\". You can figure out that the default PMECC parameter for this sam9xx5-ek board is $percntORANGE$percnt0xc0c00405$percntENDCOLOR$percnt. NAND header value is 0xc1e04e07. Detected memory size is 4194304 bytes. Page size is 256 bytes. Buffer is 93952 bytes (367 pages) at address 0x002290c0. $percntH$percnt Note that you can run several commands on the same SAM-BA invocation. With SAM-BA you can directly program SD/MMC images to the on-board eMMC. These images are named *.img or *.wic for the ones generated by Yocto Project. Detected memory size is 3925868544 bytes. Page size is 512 bytes. Buffer is 88576 bytes (173 pages) at address 0x0022a5a0. $percntH$percnt Note that programming a rootfs of several hundreds of MiB will take a few minutes to complete.